The Co-operative Group (Co-op) is to close the headquarters of Somerfield after the £1.6bn takeover of its supermarket rival last year. The move - which will affect 750 employees based in Bristol - is part of the integration of the two businesses. The Co-op said that it hoped to relocate as many staff as possible. The takeover is expected to go through next month and will cement Manchester-based Co-op's position as the UK's fifth largest supermarket chain. A spokesman for the Co-op said it was still too early to comment on any potential job losses. "Somerfield has some great people and during the integration process we will endeavour to offer relocation opportunities to as many of them as possible," he said. The Co-op is taking over more than 650 Somerfield stores. As a condition of the takeover, it agreed to sell more than 100 stores in areas where the Office of Fair Trading had concerns over competition. The merged group is beginning an advertising campaign to promote the all-encompassing Co-op. Co-op is looking to capitalise on a revival in its fortunes and double its profits over the next three years. 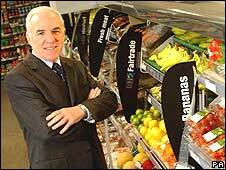 "We are witnessing a renaissance of the Co-operative," said Co-op boss Peter Marks. Tesco, Asda, Sainsbury's and Morrisons are currently the biggest four supermarket chains in the UK.